Members of the expedition cruising community will be saddened to learn of the sudden death of much-admired naturalist, Chris Cutler. Chris was a regular and sought after expedition team member, best known for his work and love for birds. He regularly charmed guests with his quiet yet authoritative style and exceptional photography. 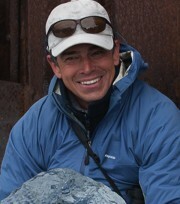 He studied biology at the University of California, beginning several years of investigation on the biogeography, ecology and behaviour of birds and mammals. Colleagues who knew Chris better than this writer are heaping accolades on their departed friend and companion. "Such a clever, inspirational and passionate man with the most wonderful sense of humour and smile." "Everyone can remember the fun and joy he gave us, the laughter and the adventures, and of course his incredible way of imparting knowledge; things we all shared with Chris, truly one of the most remarkable naturalists and wonderful people we will ever know. We will miss you terribly." I travelled with Chris aboard Orion II from Japan to Borneo and found his easy, relaxed style a perfect fit for an extended voyage like that. We talked frequently and I learned many things from him as I do from experts such as Chris. Chris also sailed most recently with Silversea. The expedition cruising community is all the poorer for his untimely departure.